A view of the opposite side of the jug. An additional perspective revealing the handle. This image also reveals the narrow geometric border. 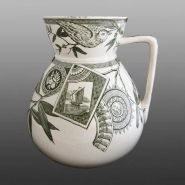 Maker: Josiah Wedgwood & Co.
An earthenware water jug printed in green in a pattern named Louise. This pattern was registered by Wedgwood and Co. in April of 1881. 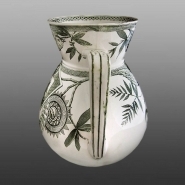 Pattern elements are asymmetrically placed on the body and neck of the vessel. A large bird positioned on a branch appears twice, once on the body, as shown here, and again on the neck of the jug (see below). The pattern design incorporates several stylized cartouches, typical of the Aesthetic period.